First World War Recruiting Posters. Courtesy Library of Congress. The initial contributions made by the U.S. in those first months were of supplies and money to the Allied forces. Although the entire regular Army and National Guard were immediately mobilized in April 1917, the U.S. military was, at the time, very small. Although Americans enlisted in the military in large numbers as soon as war was declared, in May 18, 1917, the Federal Government instituted a draft to obtain the servicemen it needed. The draft required all men between the ages of 21 and 31 to register. There were also few places to train troops, and a small number of officers to command them. Much of the summer of 1917 was spent building these camps and preparing the officers to train the large numbers of enlisted men who would begin arriving in the fall. American troops did not begin arriving overseas in large numbers until the summer of 1918 and over 1,200,000 American troops were in France by September 1918. The U.S. Food Administration launched a extensive propaganda campaign to encourage Americans to conserve food. Food conversation was one way everyday Americans could do their part for the war effort. On the American home front, there was a widespread mobilization of the economy in order to produce the supplies and munitions needed to support the troops as they were deployed. The Federal Government launched a massive propaganda campaign to build support for the war effort. Programs like the Liberty Loans and War Savings Stamps were launched to help the government raise the money needed for mobilization. The United States Food Administration, under the direction of future president Herbert Hoover, launched an effort to teach Americans how to economize on their food budgets and reduce waste. There were also efforts to conserve coal and gas, such as “fuel-less Mondays” and “gasless Sundays.” Large numbers of women were recruited into the labor market to replace men that were joining the military. By 1918, munitions factories were the single largest employer of women in the country. In an effort to show the Archdiocese’ commitment to the war effort, Cardinal Farley worked with the National Fuel Administration to have every parochial school in the diocese participate in “Tag Your Shovel Day.” The campaign was scheduled for January 30, 1918, and focused on encouraging school children to participate in war conservation methods. 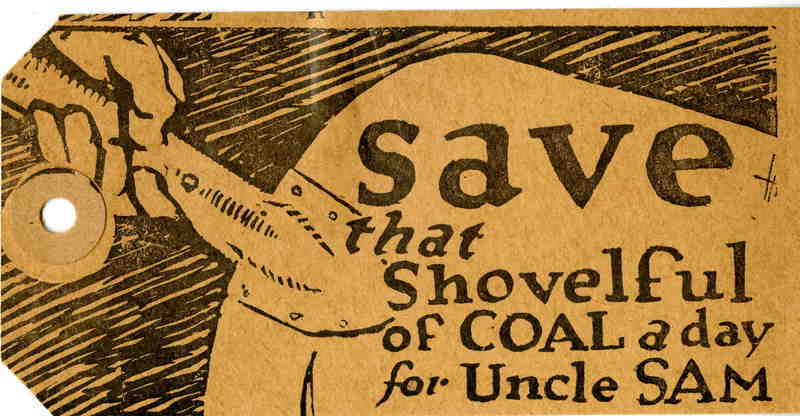 Tags were distributed to all children in school, and they were supposed to bring them home to tie on the family’s coal shovel. 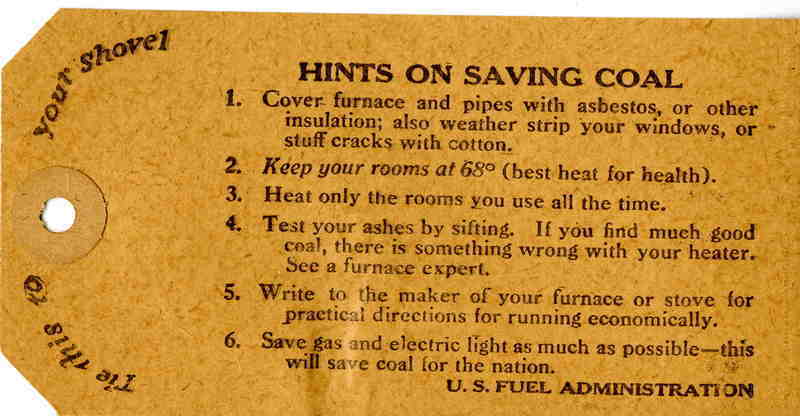 The hope was that the tags would act as a constant reminder for the household to use coal carefully.